American cars used to be rear-wheel-drive and have V8 engines, as God and Ronald Reagan intended. The Chrysler 300 is the last American car that follows this format. 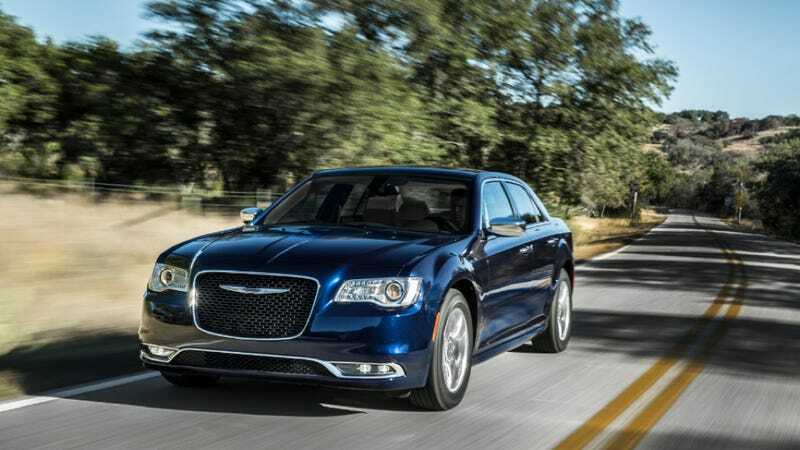 What do you need to know before you buy a Chrysler 300? Don’t worry, we’ll tell you everything right here in the Ultimate Buyer’s Guide. The Chrysler 300 is a peculiar vestige of the time when Chrysler and Mercedes were one company. The LX platform on which it’s based is, contrary to popular Internet belief, not entirely an older Mercedes platform, although it did originally share numerous parts with Mercedes (mostly from the E-Class and S-Class). Despite its German relatives, when the Chrysler 300 debuted it was celebrated as being brashly American both in layout and design. While the platform offers AWD and a V6, the thought of a HEMI V8 engine and laying out big, thick black lines on the pavement from the rear wheels is the greatest appeal of the Chrysler 300. In a segment dominated by cars created to be as inoffensive as possible, the 300 might as well be Lenny Bruce. The second generation Chrysler 300 still carries over much of the same general platform and design as the original. In fact, it’s probably fair to wonder if Chrysler didn’t just engineer the idea second “generation” so that people didn’t start to point out that it was one of the oldest cars available. Either way, the “new” car does offer a lot more than the old model did, with the newer Pentastar V6 across the range and the only eight-speed automatic in the class. It’s also added a larger, Bentley-inspired grille and a few design elements that give the car a much cleaner and more modern look. The SRT model is, sadly, gone in the U.S., but you can still get the 300S with RWD and an optional 5.7-liter HEMI if that’s your thing. The “second generation” 300 came out in 2010 as a 2011 model and brought along some good stuff like a revised interior, sleeker styling, a 3.6-liter Pentastar V6, an available 5.7-liter V8, and an 8-speed automatic transmission. 2012 brought the SRT-8 300, which cranked out 470 horses from its 6.4-liter V8. Those powertrain options are the similar in 2015, but the monster 6.4-liter SRT trim is gone and the 8-speed is now standard, whereas before it was an option on only the V6 and the 5-speed A580 was the no-cost trans for the rest of the line. Also, starting in ‘15, all-wheel drive is no longer an option on the V8. Last year also brought a revised front grille and revised taillights, as well as new safety tech on the inside including adaptive cruise control, forward collision warning, and lane departure warning. The Chrysler 300 isn’t quite the monster its Charger brother is. There’s no 470 hp 6.4-liter V8 and there’s no insane Hellcat engine. But still, the 3.6-liter V6 and 5.7-liter V8 make this car feel quick enough, and they suit the 300C’s luxury intentions quite well. The 8-speed transmission is standard across the lineup. Like its brother, the Charger, the Chrysler 300’s weight puts it at a severe fuel economy disadvantage, particularly in the city. While the 8-speed automatic, coupled with the 300’s slippery aerodynamic profile, allows for pretty decent highway fuel economy, city mileage never makes it out of the teens. All 300s come with a five-link rear suspension, short and long arm front suspension, and electric power steering. Front disks are 12.6 inches on the base car. 300s are available in four different flavors: Limited, 300S, 300C, 300C Platinum. Limited: Base model. Starts at $31,695. Notable standard features: 8-speed automatic transmission, 3.6-liter V6 engine, rear-wheel drive, 6-speaker audio system, 17 inch aluminum wheels, heated power leather seats, automatic dual zone climate control, 8.4 inch touchscreen display for Uconnect in-car communication system, projector beam auto headlamps, proximity keyless entry, front and side airbags. Notable options: all-wheel drive ($2,500); Driver Convenience Group: LED fog lamps, rear back-up camera, remote start, universal garage door opener ($1,694); Beats Audio Group: 10 speakers with subwoofer, 552-Watt Amplifier ($1,195+Driver Convenience Group); Safetytec 1 Group: Front and rear park sensors, blind spot monitoring, rear cross path detection, and exterior mirrors with turn signals ($1,695+Driver Convenience Group); 300 Premium Group: Beats Audio Group, Safetytec 1 Group, Driver Convenience Group ($3,695). 300S: Starts at $35,070. Notable standard features over Limited: 20 inch black wheels, leather trimmed sport bucket seats, Driver Convenience Group, Beats Audio Group. Notable Options: all-wheel drive ($2,500); 300S Premium Group: Blind Spot and Cross Path Detection, panoramic sunroof, mirror turn signals, front and rear park assist, power mirrors, updated Uconnect in-car communication system with navigation ($3,295); Luxury Group: Blind Spot and Cross Path Detection, heated second row seats, heated steering wheel, power sunshade, power tilt/telescoping column, unique exterior mirrors, unique interior lighting ($2,295+300S Premium Group); Light Group: automatic leveling HID headlamps ($895+300S Premium Group); Safetytec 1 Group: Front and rear park sensors, blind spot monitoring, rear cross path detection, and exterior mirrors with turn signals ($1,695); Safetytec 2 Group: Adaptive Cruise Control with brake assist, automatic high beam headlamp control, rain sensing wipers, lane departure warning, collision warning ($1,695+Safetytec1 Group). 300C: Starts at $38,070. Notable standard features over 300S: 18 inch unique wheels, memory for radio, no Beats audio (6-speaker system with 276 Watt amplifier instead), driver seat and mirrors, leather perforated seats, heated second row seats, panoramic sunroof, heated leather and wood steering wheel, power tilt/telescoping steering wheel, navigation. Notable options: Safetytec 1 Group: Front and rear park sensors, blind spot monitoring, rear cross path detection, and exterior mirrors with turn signals ($1,695); Safetytec 2 Group: Adaptive Cruise Control with brake assist, automatic high beam headlamp control, rain sensing wipers, lane departure warning, collision warning ($1,695+Safetytec1 Group); Light Group: automatic leveling HID headlamps ($895+300S Premium Group); 20 inch aluminum wheels ($995); Harman Kardon Audio Group: 19 speakers with subwoofer, delete power rear sunshade, Harman Kardon Amplifier ($1,995+20 inch wheels). 300C Platinum: Starts at $42,395. Notable standard features over 300C: 20 inch aluminum wheels, touring suspension, quilted leather trimmed seats, power adjustable pedals with memory, leather interior trim, real wood inserts, heated and cooled cup holders, luxury floor mats. Same options as 300C.